I've actually gotten a lot of stuff done on my week o'vacation. A lot of character designs for one project and a few layouts on another. A lot of accomplishment for a week where I also napped quite a bit. But this week marks the beginning of DC comics bringing back one of their more interesting characters, the Swamp Thing. I read the new comic tonight and I'm not sure if I like where they are heading or not. 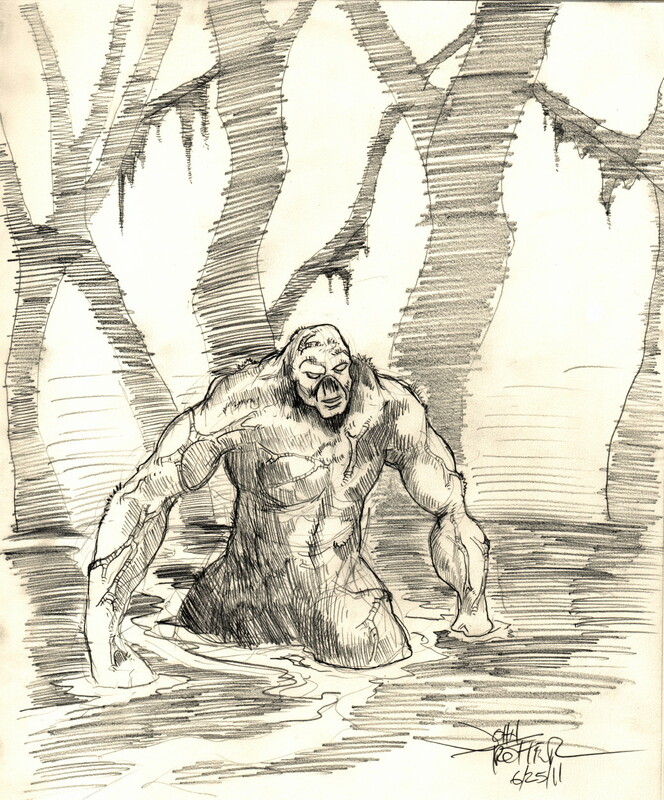 If you are not familiar with the story, Swamp Thing was created in the 1970's by the creative team of Len Wein (writer) and Berni Wrightson (genius artist). It was a tale of Gothic horror and was supremely unnerving for a child of the 70's (me). However I grew to adore the artwork of Mr. Wrightson and the horror genre in comics became one of my favorites (oddly enough I cannot STAND the horror movie genre). Fast forward to the 80's. Sagging sales prompted DC (or rather their "adult" line Vertigo) to bring in comic god Alan Moore along with artists like Stephen Bissette and John Totlebein. Moore completely re-wrote the mythos of the Swamp Thing while keeping it exactly the same. Instead of being Dr. Alec Holland changed into the Swamp Thing it was actually a Swamp Thing that THINKS it is Dr. Alec Holland but is actually an earth elemental. (It's very complicated and strange but believe me, it is AMAZING.) It was one of my very first forays into "adult themed" comics and I loved it. Full of nostalgia tonight, I whipped this up in the old sketchbook. Now DC is bringing the two myths together in their new incarnation. Alec Holland is brought back to life during the "Brightest Day" aftermath. I think. It seems as if new management at DC is trying to systematically do away with anything Alan Moore did for them in the 80's. (In the Killing Joke, the Joker shoots Barbara Gordon in the spine leaving her in a wheelchair. They're apparently doing away with that as well, even though as her new character "Oracle" she became very much a part of the DC universe during the last twenty years.) Whatever. Moore only made it that your company put out some of the most iconic and brilliant and thought provoking books of the last three decades. Just brush them aside.